Crackle or crazed tile has been around for literally thousands of years. During the manufacturing process, hairline cracks develop in the glaze. When creating a crackle tile, this cracking is intentional. The end result is a beautiful crackle finish that seems to go beautifully with virtually any style. Be aware that these cracks never stop moving. This means you need to seal the tile initially, then every several months as cracks continue to move. There are several tile products that need to be pre-sealed in order to prevent a change in appearance. This would include, but not limited to, all natural stones, all through-body porcelain tiles, all unglazed clay tiles, certain metal and glass tiles and specific ceramic tiles. The crackle in the glaze of this handcrafted tile is intentional. Virtually ALL crackle glazes from ALL manufacturers require pre-sealing. Once pre-sealed, most manufacturers recommend their tiles for wet areas. As with all products, the tile installer is to follow industry standards and manufacturers recommendations for installation. There are a few sealing options that should be considered prior to installation. 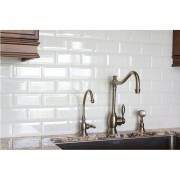 To minimize craze cracks as much as possible tiles may be soaked in sealer prior to installation. If moderate crackle is desired, simply wipe on/wipe off according to manufacturer instructions. If you really, really like those crazy crackle cracks, grout first with a contrasting grout and seal after grouting.